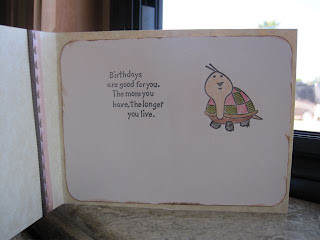 We are going to a local (and very good) Mexican restaurant tonight to celebrate the birthdays of some new friends and here are a couple of cards that I made for the occasion. 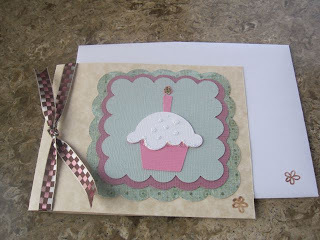 The cupcake card with it's Happy Birthday message. 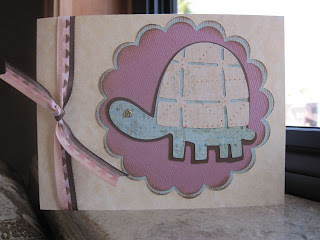 I love this turtle and the cute stamp I found at Michaels on the clearance rack (remember we're retired!!). 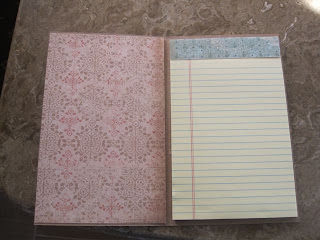 Then I found a site that showed how to take inexpensive junior legal pads and make really cute binders for them. This is my interpretation. This is really a lot of fun but very addictive. 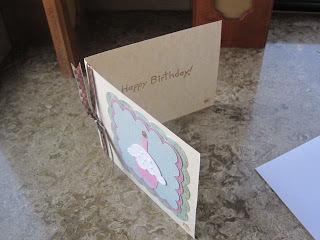 I'll see you later - I have to go get more tools and stamps and inks and STUFF!!! Have you heard of a "cricket"? My sister in law does paper crafts and every year she makes me a set of cards for Christmas and I love them...she leaves most of the blank but does a "theme" and they are so nice when you need last minute cards. 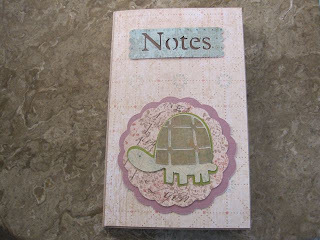 I have used her cricket for scrapbooking and it is WONDERFUL! Thanks for commenting. I bought a Cricut on Black Friday at Walmart. I decided that I would go to Wally world whenever I woke up (turned out to be 4:45 am - I'm old, remember!!) When I got there, everyone had been allowed inside and most people were in line for the TV's that were on sale. There were two Cricuts left when I finally found the display and it was an awesome price!! I've had such fun with the "bug". Today, I went to Michaels and bought the Cuttlebug at 40% off. I can't wait to play with it!! Got our Christmas Card today...loved it!! I loved your Christmas card. I didn't know you were so creative!!! Thanks y'all! I really am having fun with this, but now I want every stamp that exists! !